Titanium dioxide (TiO2) is used extensively and safely by a diverse number of industries worldwide: from paints, plastics and inks to paper, food, cosmetics and pharmaceuticals, to name just a few. A bright white powder that is also prized for its ability to hide surfaces it is applied to, TiO2 is a popular base for colour palettes that can translate onto almost any material. Its valuable ability to absorb and deflect harmful UV rays means that it has also been harnessed for essential skin protection products, as well as cutting edge environmental technologies: titanium dioxide has been used in rechargeable batteries research and is used in dye-sensitised solar cells. Several studies have shown TiO2 is safe for use in numerous applications with multiple functions. However, there is now the possibility of new regulation of TiO2 that would affect all of its uses. On the 14th of September 2017, the Committee for Risk Assessment (RAC) of the European Chemicals Agency (ECHA) proposed that TiO2 should be classified as a suspected carcinogen (cat. 2), and therefore products containing titanium dioxide would have to be labelled as such. The RAC opinion concluded that TiO2 is a suspected carcinogen, by inhalation, based on results of a study in rats exposed to ‘lung overload’ conditions. This conclusion goes against a vast body of scientific evidence that does not support a classification of TiO2 for humans. 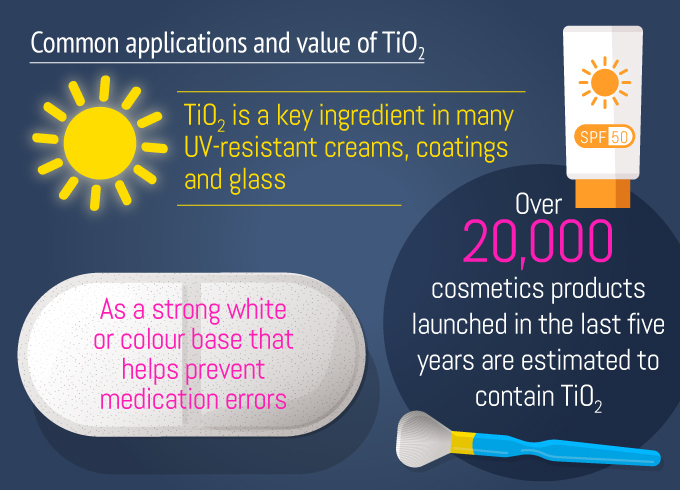 You can find out more about the safety of TiO2 on the titanium dioxide is safe page. A decision to classify TiO2 could have far-reaching consequences for both consumers and industry alike. People may not realise that TiO2 plays an essential role in the world they know today. 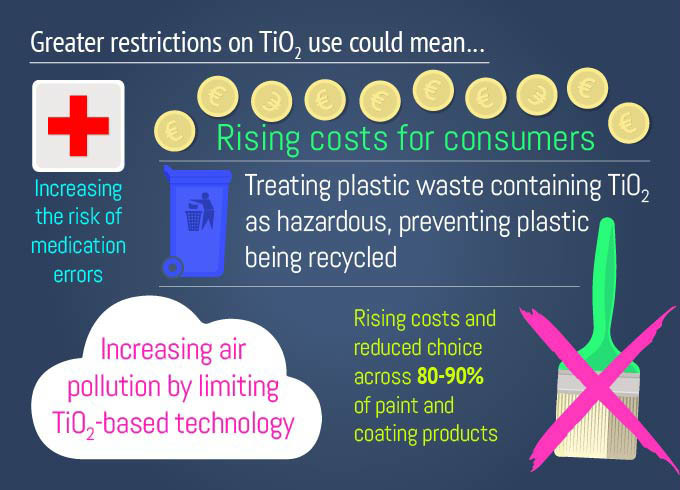 The proposed classification of TiO2 could mean less choice about how we protect ourselves, lower performance in the products and buildings we create, as well as a negative impact on the green technologies that TiO2 enables us to develop for our homes and transport. Retailers are unlikely to stock household DIY products labelled as suspected carcinogens, reducing availability and choice for consumers. Maintenance tasks may need to be carried out by professionals only, increasing cost. Reformulation of products, would be costly to manufacturers and potentially not possible, in any practical sense, for certain applications due to poorer performance or appearance. The applications and safety profile of titanium dioxide currently enables the EU’s moves to lead the transition to a global circular economy. It plays an important role in efforts to reuse, sustain and recycle materials, for instance, in the recycling of furniture. With its unique characteristics it also provides longer-lasting products, resulting in less waste; read more about how titanium dioxide protects your outdoor plastics. The move to re-classify TiO2 could have a direct impact on the EEA’s sustainable, circular economy model. 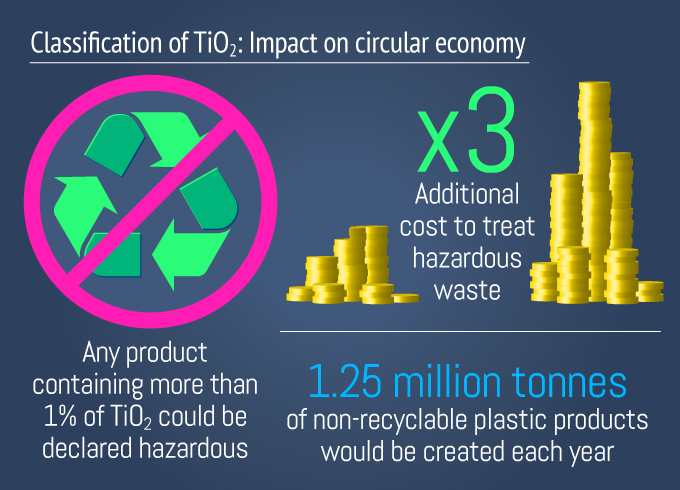 A change to the classification of TiO2 means that waste streams containing titanium dioxide, such as plastic packaging, would not be available for recycling. Re-classification of TiO2 could lead to waste containing TiO2 being treated as hazardous, hampering recycling efforts and increasing the cost of handling waste by as much as three times. Additional costs could range from a few thousand to millions of euros per site for the disposal of packaging, and management of waste from manufacturing, construction and demolition. This would have a significant impact on moves to create a greener environment. Finding alternatives to titanium dioxide – to avoid this impact on waste streams – could be technically difficult, with no known alternatives in some instances. There could also be negative environmental impacts from using other materials. For example, zinc oxide is a possible alternative whitening agent, but is classified – in some applications and uses – as toxic to aquatic life. TiO2 production and its related markets keep thousands of people in jobs across the EEA. Europe’s manufacture of TiO2 represents 20 percent of the world’s total production levels. 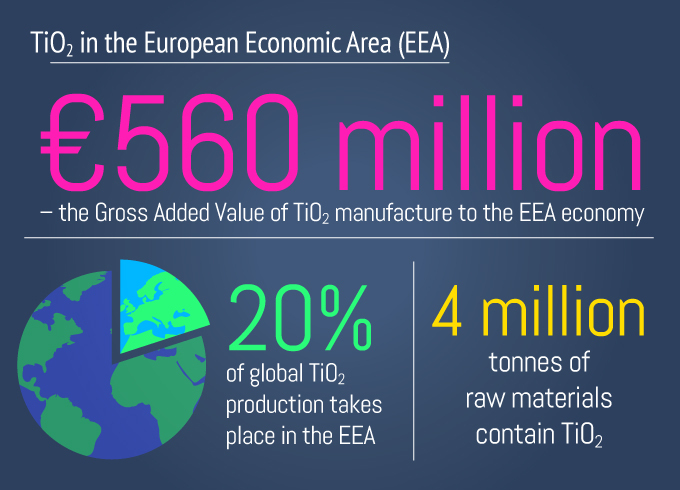 One-third of the titanium dioxide produced in the EEA is exported, in part because some TiO2 grades are only produced by European plants. TiO2 is routinely handled by millions of workers without the potential for inhalation exposure. Any move to go beyond the already stringent laws which govern its use could have widespread repercussions for workers in many industries. 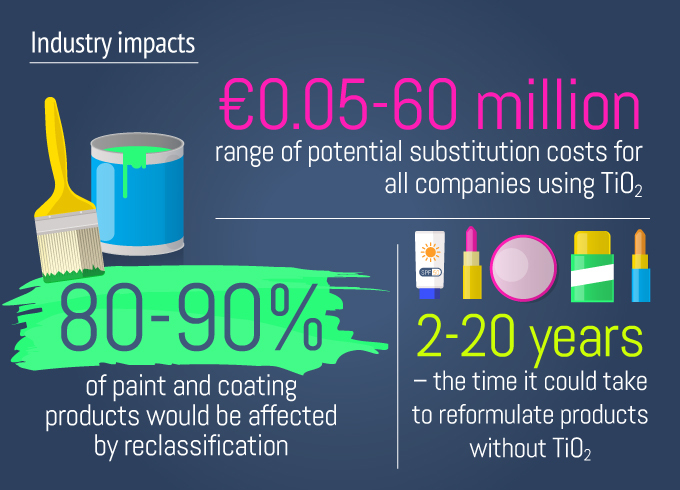 Classification of titanium dioxide would lead to costly reformulation of products, while additional workplace safety measures and costs associated with waste disposal for downstream users could run to over €100,000 per plant. As the proposed classification is based upon the perceived risk of inhalation exposure to the dust form of titanium dioxide, certain users may procure TiO2 in slurry, a semi-liquid form, where this can be used. Such businesses could face additional costs of between €200-250 per tonne. Overall, titanium dioxide manufacturers and suppliers could face a drop in demand of 15 percent. This could have a widespread negative impact on other areas of manufacturing, affecting the manufacture of titanium chemicals and iron-based co-products, as well as TiO2 and its feedstock ore operations. Unless similar classification was adopted outside of the EEA, the increased supply and production costs would make EEA TiO2 manufacturers and related businesses less competitive globally. This could lead to parts of the existing TiO2 industry relocating outside the EEA in order to supply global customers; a move that would inevitably lead to factory closures and consolidations, resulting in a loss of jobs. The production of TiO2 in Europe supports other major parts of the economy that use titanium chemicals and iron-based products. This includes steel and aluminium industries, as well as panel-manufacturing, construction and domestic appliance production. For downstream industries – sectors that incorporate TiO2 as a raw material into finished products – there could be significant job losses. 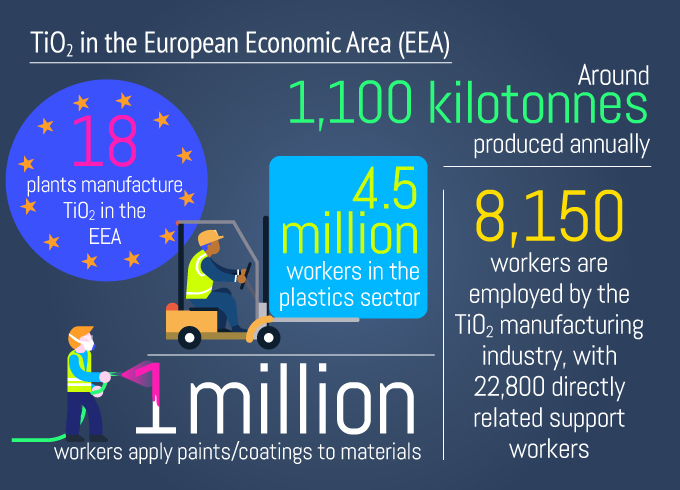 There are one million workers applying paints and coatings across Europe, and 4.5 million workers involved in the plastics industry. Even a modest impact from reclassification could lead to significant job losses: The Global Wallcoverings Association (IGI) has suggested that all 26,000 jobs in that sector alone would be at risk following the adoption of the proposed classification. Eleven companies in paint and printing inks manufacturing estimated that 15,000 jobs could be lost as a result of a re-classification of TiO2. In the plastic conversion industry, which supports 1.5 million jobs, a similar number of jobs – 1% of the workforce – could be lost. Businesses could become less competitive, both domestically and globally, with the added perception of risk having an adverse impact on sales. Any businesses looking to reformulate face high potential costs – with the wall coverings sector looking at a €400,000 reformulation bill per company that could actually deliver an inferior solution. 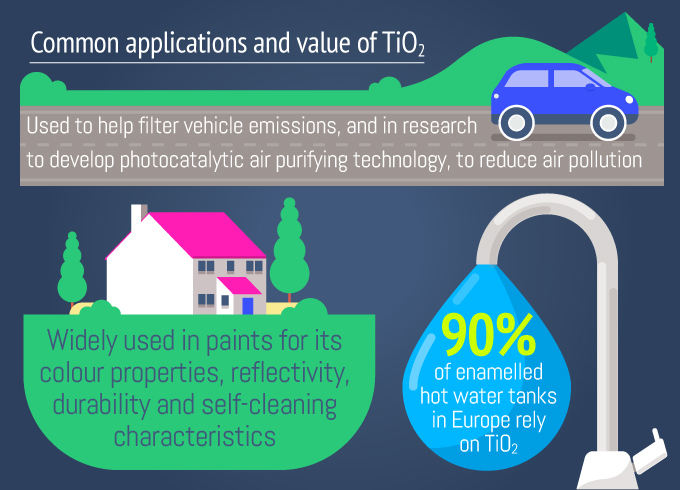 It is estimated that on average, a company would face costs between €50,000 and €60 million to substitute TiO2, with solutions that could take between two and 20 years to develop. In many cases, companies would be left marketing inferior products, offering less choice to their customer and potentially charging higher costs. For example, TiO2 currently offers a safe and effective UV filter in a wide selection of sunscreens; reclassification could restrict this use. The reformulating of paints could negatively affecting the finish offered, both in the colour, and the quality and durability of coverage achieved. Small and medium-sized enterprises (SMEs) account for a large proportion of TiO2 users, with more than 5,500 SMEs operating in the cosmetics industry alone. 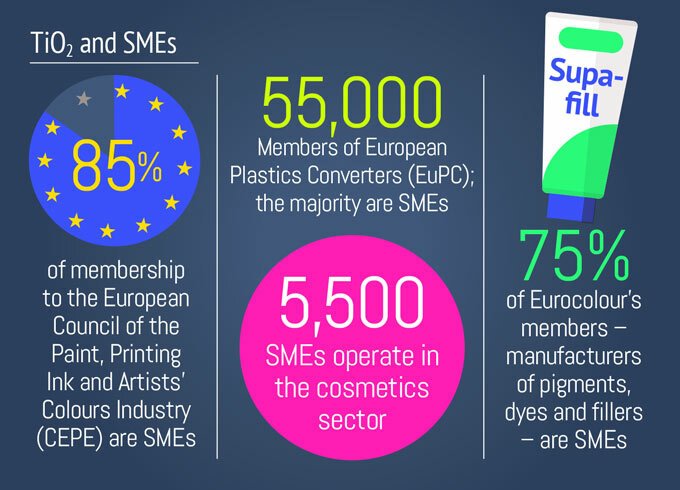 More than 750 of the paint and ink manufacturing companies in the European Council of Paint, Printing Ink and Artists’ Colours are SMEs. Any loss of access to essential raw or associated materials would prove highly problematic for companies of this size. Limited time and resources also make SMEs vulnerable to the burden of regulatory changes, as well as the additional cost of R&D and marketing. While larger companies may opt to move their manufacturing base outside of the EU, this avenue is likely to be closed to the average SME, which may have to rely on a third-party to complete the manufacture of products. TiO2 is part of a group of substances with a similar toxicity profile known by the umbrella term of ‘poorly soluble low toxicity (PSLT)’ particles. Adoption of the proposed Category 2 label would pave the way for the classification of other PSLTs. This means that all poorly soluble powders that could replace TiO2, including minerals such as kaolin, chalk, and talc could be treated as suspected carcinogens in the future. Furthermore, the precedent may also apply to other important substances for the EU manufacturing sector such as carbon black, inorganic coloured pigments, iron oxides, cerium oxide, aluminium oxide, magnesium oxide and plastic dusts, among many others. These substances are used in a myriad of ways, here are just a small range of examples: antibiotics and other leading medical products (including the use of bentonite as an antidote in heavy metal poisoning); agriculture, ceramics, fire extinguishers, brake pads, during the clean-up of hazardous materials, decorations and floor coverings, as well as in food and toiletries. As a result, the proposed classification of TiO2 would be unlikely to offer any additional protection to workers’ health through substitution as its direct alternatives would have an equivalent carcinogenicity hazard profile. In summary, the manufacture, handling, use and disposal of PSLTs would become more costly and burdensome in the EEA, thus leading to further loss of competitiveness of EEA businesses. Classification of TiO2 could mean new regulation that has widespread negative impacts across Europe, affecting both workers and consumers.